I took the train to New York City yesterday, and came back home today, very late afternoon. 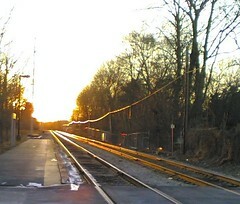 The setting sun was just at the right angle to make the railroad tracks look golden. I took some pictures with my phonecam, and here is one of them. Although I cropped this image for the composition, I did nothing to change the lights and colors, which are just as they came out of the camera. This is another posterized picture taken with my old phonecam last year. I like to shovel snow, and I say it is because it is great exercise (which it is). But I secretly love to be out in the new snow because I love the way it looks. This week I took a picture of the sunrise through the window. 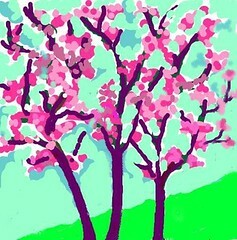 Tonight I cropped the image and posterized it in Painter IX. Today is a cold, gray January day. But I read a poem recently ("Pied Beauty" by Gerard Manley Hopkins) that made me think about the dappled light of summer and reminded me of my many attempts to capture it. 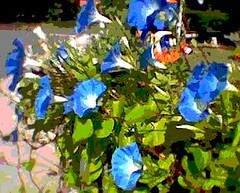 This image began with a photo taken one summer morning with my old phonecam, which created soft little pictures, great for close pictures of flowers, but too indistinct for scenery. 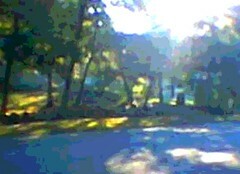 I remember being frustrated that summer morning because I couldn't get a clear picture of the beautiful dappled light on the lawn and road. So today I decided to posterize the photo using Painter IX, and here it is. I wasn't planning to work on this pastel today, but I was really eager to return to it. I finally had a short break in my schedule, so in spite of frigid temperatures and freezing wind, I went over to Red Brick to work on it for an hour. I changed the shape of the flower pot, reverting to the shape I had used in an earlier version. I fixed some problems with the elipses, then softened up the edges. Then I worked on the leaves. I had already added some blues and yellows for variety, so today I went over them with some transparent green and white tones to make the leaves look more alike overall. 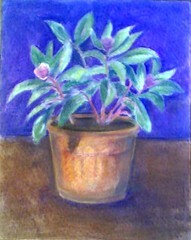 I added some definition to the flowers, and sharpened the background shapes, using blue-violet pastel. By then it was time to head home. There are still some things left to fix, but I am feeling better about this little makeover. 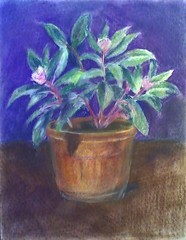 Today I returned to Red Brick to work on this pastel drawing. I added more color to the flowers, and worked on the background, but most of the time I had was used to work on the flower pot. I am trying to get the perspective right, which means working on the elipses (ovals used to draw a cylindrical object). I am doing this by eye, with the help of a straight edge and a mirror. This is the hardest part of doing a still life, and I can't really say it is the most enjoyable part. But I think it is good for me as an artist to struggle with this kind of basic problem. It is kind of like lifting weights: you have to keep doing it or you lose ground. And it really is important. Even though no one ever congratulates an artist on phenomenal elipses, if those pesky little ovals are seriously off-center, it will register with anyone who looks at the drawing (even people who aren't consciously aware of those ovals) and the drawing will look and feel "not quite right." In the case of this little pastel makeover, I still see a few problems with the elipses that need fixing. Then I can get back to the fun of adding color to the leaves. To be continued. . .
Today I went to Red Brick and had a chance to work on this pastel makeover, finishing a drawing that I started several years ago. First I added color to the flower pot. Then I added some blue and yellow tones to the green leaves. I eliminated one or two leaves that seemed confusing. I was working on defining lines and edges when I realized that the container was not centered. So I spent time moving the container, which meant re-doing the elipses, and checking them in a mirror. The elipses still need a bit of work, but it was time to pack up and go home. I will work on that next time; this is still a work in progress. To be continued. . . Here it is the third week of January, and we have had very little snow here north of Boston. But this morning there was just enough snow on the ground to shovel (only the second time this season so far). I like shoveling snow for the exercise (not bad with an iPod to keep me company) and also for the chance to take pictures while the snow is still fresh and undisturbed. This morning I noticed the snow on the shrubbery. 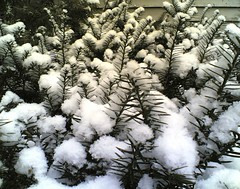 I liked the contrast of the pattern of the evergreen needles and the soft, cottony snow, so I took a couple of pictures with my phonecam. Tonight I cropped the photos to improve the composition. I think this is the best of them. Today I worked on framing my pastel drawing of spider mums for the art auction at Red Brick this weekend. 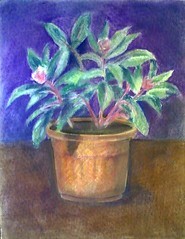 But in the process, I came across another pastel drawing that I started several years ago at a drawing group evening. Apparently, I didn't have time to finish this still life within the two or three hours of the session. Although I am happy with the composition and the shapes of the leaves, I am not satisfied with the colors, and the drawing doesn't look finished to me, especially the plant itself. I decided that it is time for another pastel makeover. So here is the BEFORE picture. To be continued. . . . This is another picture from Friday's trip to New Hampshire. 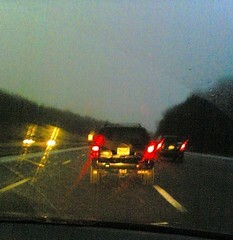 In this early morning photo, the sky is already light, but the lights of the cars are still visible. I liked the shapes, colors, and the light diffused by the rain and the windshield, so I took this picture with my phonecam. 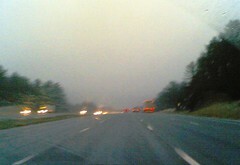 This is a photo I took yesterday on the way to New Hampshire. I enjoy the passenger seat so I can watch the scenery and shoot pictures with my phonecam. This was taken just before sun-up, with the temperature just barely above freezing. I liked the shapes of the trees against the sky and the way the car lights looked through the rainy windshield, so I took this picture. Tonight I cropped the image to get the composition I was after. We usually regard cars and highways as unworthy subject matter for art, but I think it is good to see beauty in what is around you, even though (especially because) it is something that you see all the time. Today I took my paintings to New Hampshire for the art show. 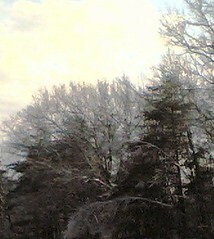 Although it was raining at home in Beverly, there was ice and snow in New Hampshire. 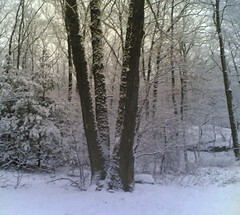 The trees looked beautiful, and I took pictures with my phonecam. Tonight I cropped this one to focus on the lacy white branches of the icy trees. I took this picture today, just before I took these drawings down and packed them up for my art show in New Hampshire. In late November, I had hung them up for Open Studios at Red Brick. I made these drawings from an old abandoned figure painting I had started with acrylic paint; this fall I cut the painting up into nine pieces, and drew into each piece with conte crayon, making nine small landscapes. The position of each drawing on the wall corresponds to the position of the piece of paper in the original painting. 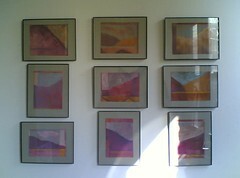 When I hang these drawings in New Hampshire, I think I will hang them in one horizontal line. But in case I change my mind, I can use this photo for reference. The temperature here is absolutely frigid, but the amaryllis is in full bloom today. Of course, I took pictures with my phonecam. I chose the image I liked best, cropped it for the composition, and then opened it in Painter IX. I decided to try to posterize it because, well for one thing, these days I am posterizing everything that moves (or doesn't) because it is fascinating to me. It is fun to see what happens to the colors, and I thought the effect on the blossom and window blinds would be interesting. I played around with the posterizing controls till I was happy with the effect: a nice tropical image for a freezing cold January day. 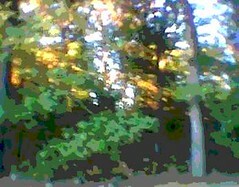 This image began as a photo taken at Long Hill Gardens a few summers ago, with my old phonecam. It took soft, fuzzy images, and I really liked the effect for closeups, but often the photographs of scenery were very indistinct and blurry, as in this case. But I liked the effect of the light in the original photo, and decided to see if I could do something with the image, so I opened it in Painter IX. I softened the focus even more, then posterized it, creating flat shapes, (like a poster). I tried several levels on the posterize controls until I found the effect I was after. Then I cropped the image, and here it is. 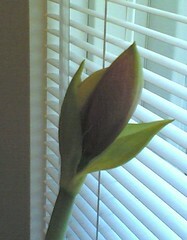 It has turned cold but the amaryllis is starting to open up near the window. 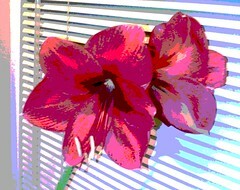 The amaryllis makes huge flowers in winter, just as the days begin to get longer. This flower has persistance, patience, and can endure against the odds over time. The bud looked nice against the window blinds so I took this photo yesterday in the low winter light. Tonight I cropped the image until the geometry of the composition was the way I wanted it. This is the other painting that I finished this week. I added more brown and purple to the mountains. 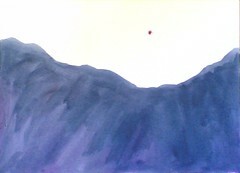 Then I added a blue wash to the sky, and a red sun (of course). 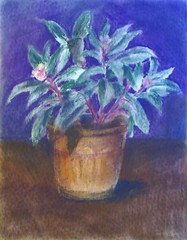 This painting will also go into the art show in New Hampshire. This week, I finished up two small paintings that I want to include in the upcoming art show in New Hampshire. This is one of them. 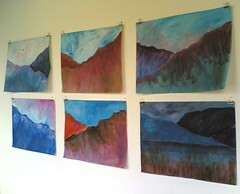 This is a photo of my mountain paintings, hanging on my studio wall. I had them hung up with pins and clips for open studio at Red Brick. This week I had to get them framed for my art show in New Hampshire. But I really liked having them on my studio wall, so I took a quick picture with my phonecam, just before I took them down. 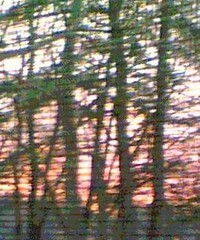 This image began as photo that I took a few years ago with my old phonecam. I loved that little camera as much for its limitations as for what it could do. It took great closeups of flowers and leaves, for example, but pictures of landscapes often lacked detail. But sometimes the softer focus has its own charm. Tonight I took the original image that I had taken with my phonecam and opened it in Painter IX to see what I could do with it. I liked the composition and the light, but the focus was not sharp enough. I decided to try posterizing it. I had to adjust the levels several times to find the one I liked the best. This is the version I decided to use. It captures the feeling of the light, but the shapes are simplified and are more abstract. 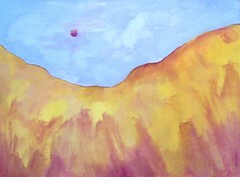 I painted this image when I was a student at the University of Colorado. 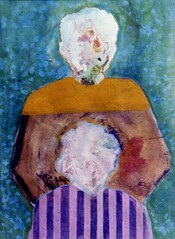 It is acrylic paint, used as watermedia, on paper. The two figures could be anyone at all (I was focussed on the composition, the patterns and the colors). I made this image many years ago, but since then I have often seen this pose in life and in photographs. 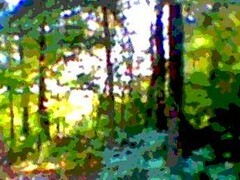 This image began as a photo I took two summers ago, with my old phonecam. Tonight I found the image and decided to open it in Painter IX and see what would happen if I posterized the image. I always liked the photo, especially the color, but the background was too complicated. But I decided to posterize it at a level that simplified the detail in the background, leaving only shapes and colors. 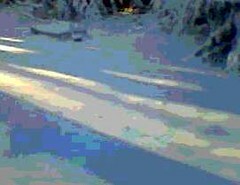 This is a photo I took with my phonecam, a little over a week ago, on December 30th. It is hard to remember that we had a snow storm, because it has been so warm lately. This is the little sketch I started yesterday on my PDA paint program, called Pocket Artist. Tonight I opened the image on my computer and again used Painter IX to modify it just a bit. I straightened out the tree trunks with digital pastel, and added two small branches on the right to balance the composition. Then I did a little more cleaning up, but didn't do too much because I didn't want to lose the spontaneous feeling of the original. 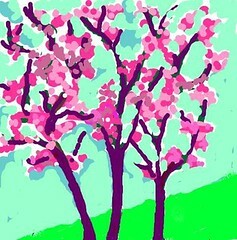 Today I wanted to try out Pocket Artist, a paint program recently installed on my PDA, so I started sketching. I guess my choice of imagery here was influenced by the warm, spring-like weather we are having in Boston. People were out flying kites at the beach! (However pleasant the weather, it is strange and worrisome, especially in view of the big snowstorms in Colorado and the windstorms in California. )Anyway, this little drawing is still a work in progress. I was able to transfer this little sketch into my computer, and was able to open it with Painter IX and clean it up just a bit to make it presentable. To be continued. . . 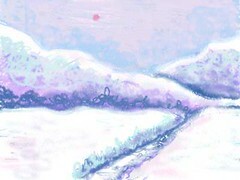 Here is a piece of digital art, a little drawing I recently did on the computer, using Painter IX's digital pastel and pastel pencil. The swirling strokes reflect a playful response to snow and to this drawing. Today seemed like spring, with temperatures over 50 degrees. It is hard to remember that we had a snow storm so recently. This image is a reminder. 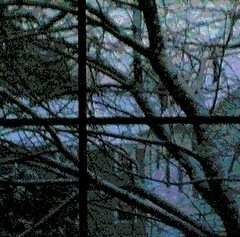 It started as a photograph that I took with my phone cam, looking out through a window at a branch covered with snow. Tonight I cropped the image to straighten out the window panes, and played with the contrast a bit. Then I opened the image in Painter IX and posterized it, experimenting with levels till I had what I wanted. Then I decided to crop the image again to get the branch in the best position, and discovered that I preferred the image with the window panes off-center. Here is another painting that I started yesterday at Red Brick Art Center. This is acrylic paint used as watermedia, and the imagery is from my imagination and my memories of Colorado, where I grew up. Although I am not trying for realistic color here, the Colorado mountains really do look pink at certain times of the day. 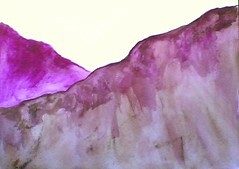 Yesterday when I mixed brown and pink together, I really recognized a color that reminded me of the Colorado landscape. This little painting is a work in progress. To be continued. . . I went to Red Brick today. My main task was to seal the edges of an oil bar painting that is going to be part of the upcoming auction. But while I was in my studio, I did I little bit of work on this painting that I started in early November. Over the past few days, we finally had some snow. (It has come and gone, thanks to today's rain.) 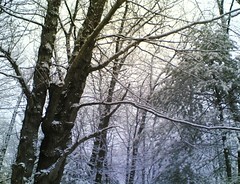 But while it lasted, I went for walks in the snow and took some pictures with my phonecam. This is one of the photos I like best. Tonight I cropped the image, trying to balance the composition. Too much snow can be an obstacle, even a danger, and nobody wants to have too much of it. But still, I agree with our little dog that snow can be fun and it makes me feel like a kid to walk around in the snow just to look at everything. Snow changes how we see, bringing out patterns and textures and lines that usually go unnoticed.